Once it gets bad and there is some hair loss and itchiness I think that she will treat it, and I will be able to help her. Other than that, I'm not really sure that there is a solution. Thank you anyways for your new ideas and enormous help! Sorry- forgot to mention we treated her for for fungus because she had foot fungus over the winter! It is probably spreading to her skin. I just wanted to let you all know that Jasmine died this week. At the time, she was living with her owner. I just took care of Jasmine over the winter while her owner was unable to. 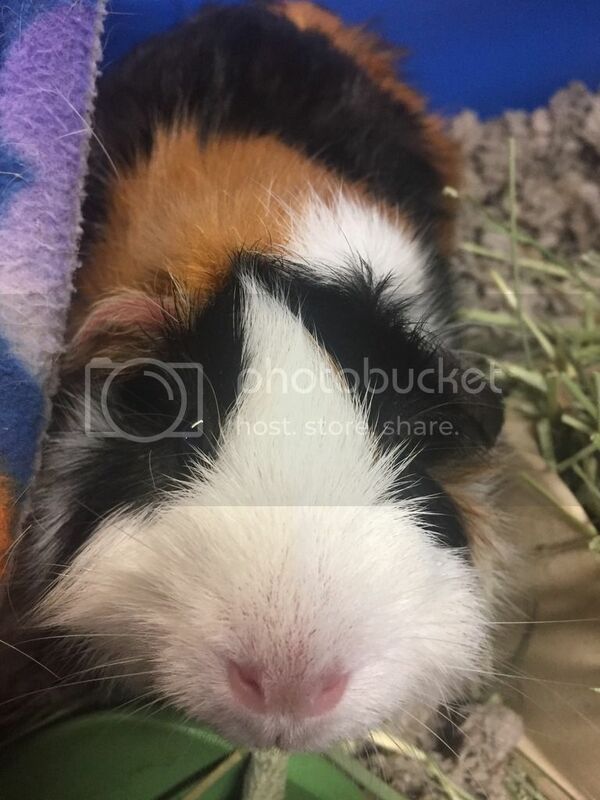 Jasmine was one of the nicest guinea pigs I have ever met. While some pigs might have been scared after moving to a new environment, Jasmine was outgoing and loved getting pet. She would curl up in your lap and start purring, and help me through a very difficult time in my life after multiple family members passed away. Without Jasmine, I don’t know how I could have gone through that. I’m beyond angry (and sad) right now. I have always known Jasmine was sick; after her fungus, weight loss, distinct pear shape (cysts??? ), and eye discharge, it was clear that she needed medical attention. But no one would believe me because I’m “just a teen” and her owner said she was okay. I tried my best to get her medical attention and treat her myself, for what I could (like fungus), but even after all of my attempts I was not able to get her the vet which she needed- I would need someone to drive me 30 minutes away, and no one would. Her owner told me that Jasmine died of old age- I don’t think this is right because she was only two years old. I can only hope that she passed on peacefully, and that in the future people will trust me. Jasmine, I’m sorry that you had such a chaotic life. From growing up in a pet store, then living at a petting zoo with irresponsible owner, I can only hope that I was able to provide you with a loving home. I love you very much and with you could be with me right now. 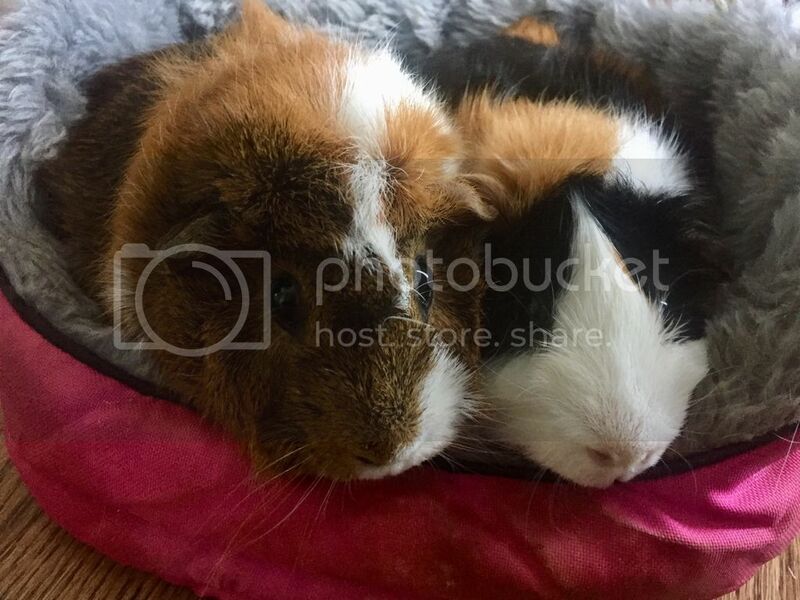 We also got the news that they got another guinea pig to keep Pigsy (Jasmine’s Cage mate) company. They got her from a pet store, probably did not check to make sure she is female, and definitely didn’t do a proper introduction or quarantine. It’s so frustrating! I wish them would do research and learn to take better care of their piggies. I’m not sure if I’m going to go back to this petting zoo. It would definitely be hard for me- but no one clips the guinea pigs’ or bunnies’ nails, so I might just go once a month to clip their nails. It makes me sad because they do a lot of things at the farm that I don’t think are very responsible, and I really don’t want to support them. I am so sorry for you, piggylover49. 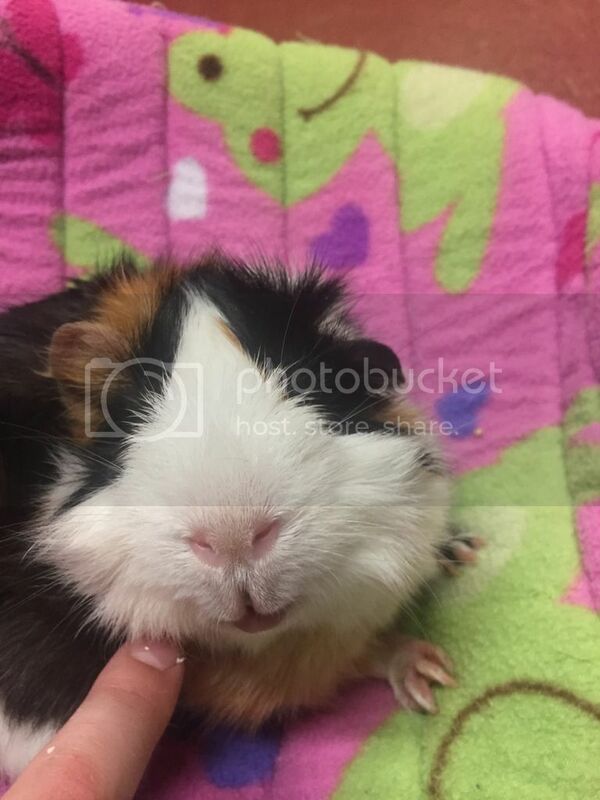 It is clear you cared a great deal for this guinea pig, even though she was not yours. You have a good heart. Thank you so much, Lynx, for your kind words. I really appreciate the support and suggestions you have given me with Jasmine. I'm so very sorry about the loss of Jasmine. Rest in peace, little one. You are loved and missed. Thank you so much, GrannyJu1. I really appreciate your thoughts. I also wanted to share a picture of Jasmine, since no one really has seen a picture of her besides medical pictures. I hope I posted these correctly! Thank you so much everyone. I don't know what I would do without GL. 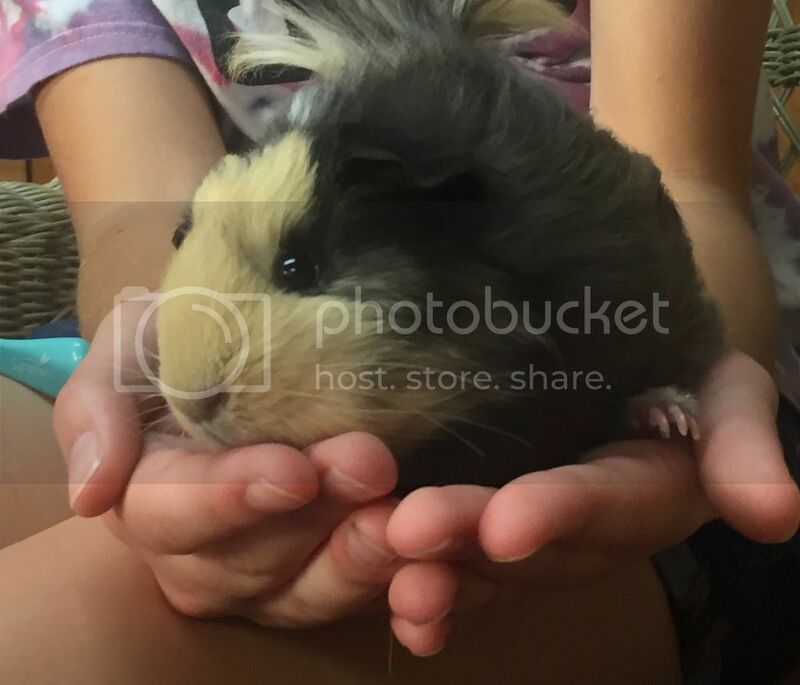 It has been really hard losing Jasmine, but GL has made it easier because their are other people who love their piggies as much as I do and understand how hard it is when they pass away. Thanks so much. Too sweet, and again, so sorry you lost her. Today I visited Pigsy, and the New Guinea pig, Helen. Helen is the cutest thing! She’s a little baby- they got her from a pet store (I know, not good, I would have adopted one but it wasn’t my decision). I cut their nails, because that is my job- and I noticed Helen has an extra toe, a polydactyl! I also double-checked and Helen is female, and seems to be in good health (from what I can tell). I also noticed Pigsy has a TINY amount of nose crusties- but she was acting totally normal. I’m trying to get them both to the vet, I know they both should be going and I’m trying my best. 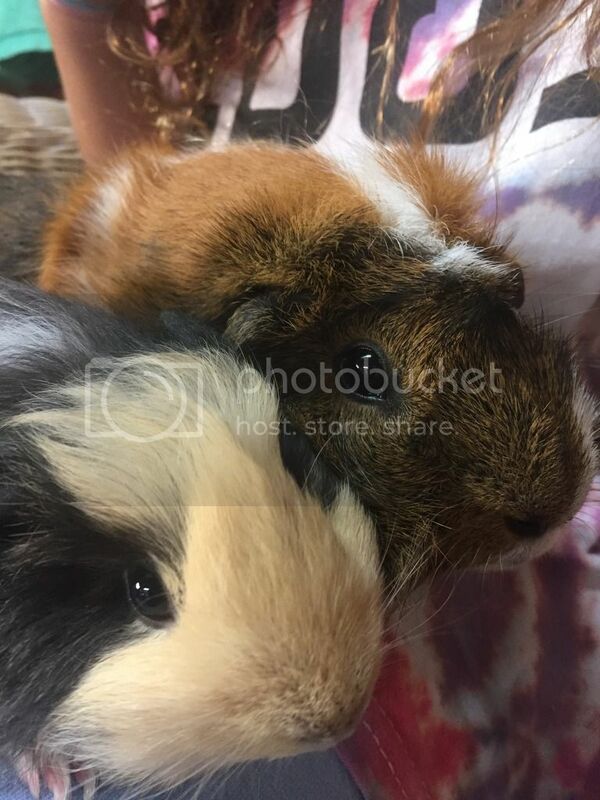 The pet store told the pigs owner that baby guinea pigs can’t eat veggies until they are six months old and to feed both Pigsy (a two year old) and Helen (about 3 months old) BOTH alfalfa pellets and alfalfa hay. What do they think they are doing?!?!?! I told her owner to feed them both adult pellets and Timothy hay, and to separate them at veggie time. Pigsy will be getting regular adult piggy veggies, Helen will be getting mostly dill and parsley, with some other veggies too, Helen’s veggies all totaling to about 2/3 cup. That sounds good, right? Thanks again everyone for you help. I also attached picture of Pigsy and Helen. Pigsy is the tan Abyssinian, Helen is the gray long haired one (don’t know her breed!). Oh, they are both so cute! Yes you are right on the food. Fresh vegs will be good for them and make their lives more interesting. Thanks Lynx! Also what do you think I should do about her extra toes? I don’t know that it has bones it it, it is a little dangly but attached pretty firmly to the foot. I don’t think I willl be able to get them to the vet; believe me, I tried to convince their owners, even saying I would bring them, but they don’t want to. They are their piggies and I tried to convince them, at the end of the day they are their piggies and they make all of the decisions. I know I shouldn’t try and remove it on my own, but should I try to clip the nail (not the whole toe, just the nail)? I’m scared I’m going to pull it off by accident. Also, is there anything you think I could do for them? I’m nervous because Pigsy had a little bit of boogers today and Jasmine died of unknown causes. I really care about them and I wish I could bring them to the vet! You can read about polydactyly in the guide. The main thing is I am guessing, how dangly it is and whether it might be ripped off accidentally. I can sympathize with you having a hard time convincing others that piggies are ill. I have had that situation a few times even with the vet. When you are spending a lot of time around them you get to know how they behave and pick up on any change in behavior or habits. When someone is only seeing them for a brief snapshot they dont appreciate that something changed as they dont know them like you do. Best of luck with Pigsy (Monkey Magic?) and Helen. Thanks you both so much! Yes, even though they arent mine I handle them the most and deal with nail Clipping, etc. and fostered them until late spring this year. Their current owner doesn’t spend much time with them because she has 3 dogs, 5 cats, and a whole farm, so she only feeds them and cleans the cage, very limited amount of handling. I also know the basic signs of a sick Guinea pig pig- when she lost about 200 grams no one would believe me that’s it’s not normal for a guinea pig to loose of of this weight without a cause. I wish she would do research instead of making assumptions! I was at sleep away camp for a while and the scale broke so I was not able to weigh her in her last month or two of life. I’m now really nervous about Pigsy (no not from Monkey Magic, sorry rjspicer!) and Helen. Before Jasmine died, her symptoms were eye discharge and weight loss, and one bout of diarrhea, and now Pigsy has some nose discharge (even though it’s a small amount, they’re not supposed to have any, right?). I’m guessing Jasmine has a virus, especially because a few weeks before they had summer camp in that room and there were tons of little kids sticking hands inside the cage and petting them. Also Helen was got from a pet store :( so I hope she’s not sick and hoping that her polydactyly will be okay. At this point I’m kind of looking for an excuse to bring them to the vet, they have never been before and I would very relived if they could get checked over- I don’t want any more sick piggies! Sorry for the rant- I’m so frustrated. I’m so sorry for the loss of Jasmine and admire you so much for trying to do the right thing for these piggies. If they are from a pet store there is usually some health guarantee like 30 days or 3 months or something. That would be a good reason for the owners to get a vet checkup right away. Also, I hate to say it but this farm doesn’t sound too responsible about their animals. It seems to me they are taking on too many animals and don’t have the time to provide good basic care, and don’t want to spend money on medical care. I understand your hands are tied here, but is there an adult in 4-H that would be sympathetic to these animals needs that you could talk to? Just my opinion. piggylover49, I happened on to this thread by accident and read it beginning to end. Even with adults involved, you, the teen is clearly the most mature and responsible person. I felt so sad and teared up upon reading that Jasmine died at such a young age. The fact the owner told you that Jasmine at age two died of old age is clear that she knows nothing about guinea pigs. I loved taking my niece and nephew to the petting zoos when they were younger and frankly I didn't think about how it might have been for the animals there. The petting zoos we went to were part of larger city zoos, so it would have had more maintenance and hopefully knowledgeable workers. Thank you for all you did for Jasmine and now do for Pigsy and Helen. You are a really caring and compassionate person. I hope you will be able to care for Pigsy and Helen this winter. Thanks you so so so much, ItsaZoo and SSLee. I really appreciate your kind words, you have both made me feel a lot better for what I have done for the piggies. Helen is from a pet store, but it is a privately owned family one, not a big company. I still consider them a pet store because they don’t take very good care of their animals and don’t get rescues. I’m pretty sure they don’t have a health guarantee, I couldn’t find one on their website. Thanks anyway for the suggestion! I really appreciate it! Yes, I agree about the farm not being very responsible. One time they “accidentally” bred a brother and sister goat- they put them in the same pen and didn’t think they would have kids together, then after they kept them in the same pen (ew!). 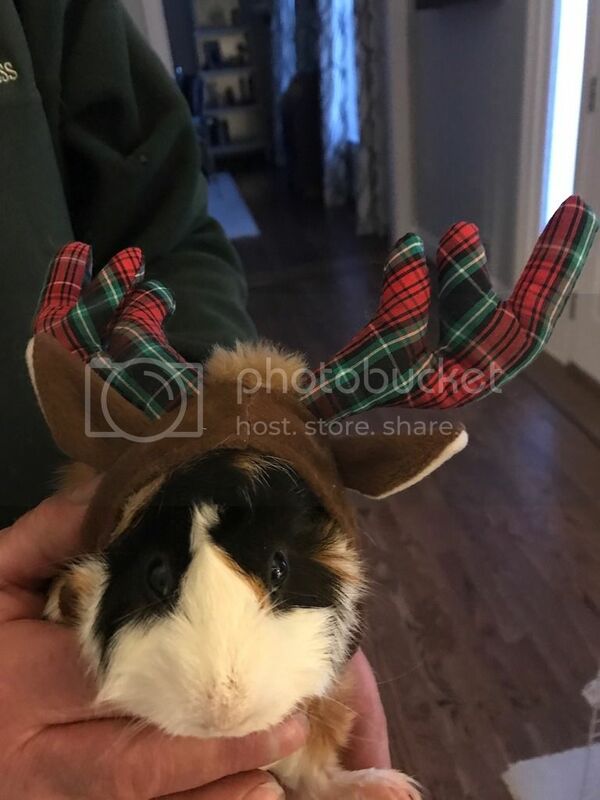 I used to think that they took good care of their guinea pigs until a few months ago. Also, I have tried talking to other people at the farm. They all say that the owner is the animal expert and that I should trust her. I don’t know that anyone off the farm could actually help me. The only reason I still go is because I think that I can make the animals lives a little better, especially when I clip all of the bunnies and guinea pigs nails. Also, I’m not going to be able to take care of them over the winter. I REALLY REALLY REALLY want to, and know I would be able to, but we recently got a dog, and my parents say they’re worried about him trying to eat the piggies. I have suggested everything to show them that he would not be able to get to them: keep them in my room with automatic door closer, a sturdy cage, indoor electric fence, etc, etc. They say that even though it is a very very small chance, they say that they think it would be super traumatizing if he did get to them. I did explain that they would be in much better living condition here, but they won’t let me. I’m super sad, but am still trying to convince them. I hopefully will! Thank you all so much for your advice and kindness. I really thankful for all of you.